Zion's South campground is on a first come first use basis and does fill up early in the day. It is normally open March 13 through October 31. There are no hookups or showers but the campsite is closer to the river than the Watchman and there is more available shade. Sites: $16 per night . Amenities: restrooms, picnic tables, RV dump, drinking water and utility sinks. The East Zion Riverside RV Park is nestled in a valley surrounded by towering mountains. Wooded acres overlook the lush green golf course and the head of the Virgin River. This small RV park offers a seasonal outdoor pool, hot tub, on-site lodging, dining and you back your ride to the edge of the river. 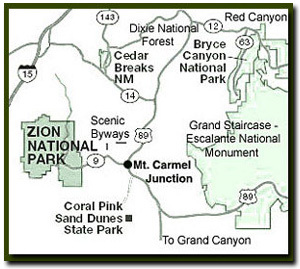 Location - 12 miles from the east entrance of Zion National Park at the Junction of SR-9 & US-89 in Mount Carmel Junction. This is a convenient place to stay for those that also want to visit Bryce Canyon and Grand Canyon. The Coral Pink Sand Dunes is also a short jaunt away, as well as Cedar Breaks, Dixie National Forest and the entrance into the Grand Staircase-Escalante National Monument. 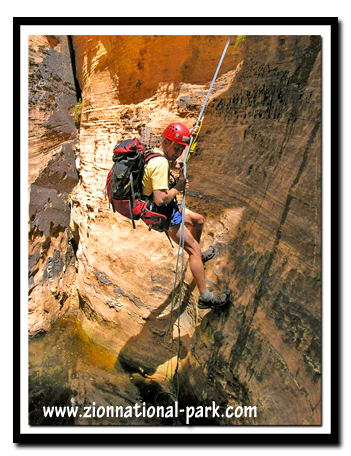 Zion Photo: Double Falls is a delightful, but very long day hike in the Kolob section of Zion National Park. Kolob Terrace - There are six primitive sites at the Kolob Terrace section of Zion National Park. The sites are located at Lava Point and it is primitive camping. The sites are usually open from June to November, but the road will close in the winter due to snow. There is no water or other amenities at the campground. Coral Pink Sand Dunes State Park - The Coral Pink Sand Dunes offers a well maintained 22-unit campground with pull-through parking, toilets, showers, picnic tables and grills. This is ATV Central with abundant off-highway tracks. Location: East Zion. Turn off 3 miles south of Jct. SR-9 & US-89, then continue 8 miles.